Over the last five years, C.L.A.S.S. 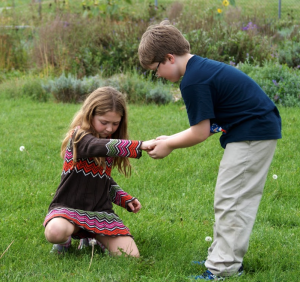 students have come to recognize that we are, all of us, connected together in very intricate ways. Through their exploration of human rights they have met and formed relationships with people in our community–including students in Afghanistan, children at Wadewitz Elementary, residents at HALO–many of whom have experienced a loss of the most basic rights: food, shelter, and education. Last year, C.L.A.S.S. created Voicebox, which grew out of their recognition that certain peoples in our world have become disconnected from each other, from the political or social process a nd are, in a way, voiceless. The students also realized that we, as with most people in the world, have never had the opportunity to hear what billions of people think, feel, and say. And so they are reaching out to learn about each other and our connectedness so that they can be of better service to each other and our world. The 2013-14 school year was spent documenting the stories of individuals who had or were currently experiencing homelessness and sharing those stories with others. Going back to previous years’ endeavors, then, and connecting the relationship between food insecurity (or hunger), poverty, and homelessness, C.L.A.S.S. began its fifth year on October 2, 2014, by heading out to the farm–the Fondy Farm Project, that is–in order to better understand the connection we have to our food source, and to the people who grow it. 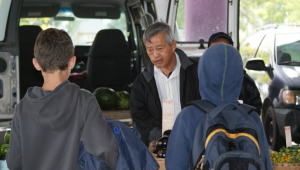 This mostly Hmong immigrant-farmed land is connected to the Fondy Farmers Market in Milwaukee. The oldest farmer’s market in Wisconsin, Fondy Market serves to connect Greater Milwaukee to local, fresh food – from farm to table. On this day, C.L.A.S.S. 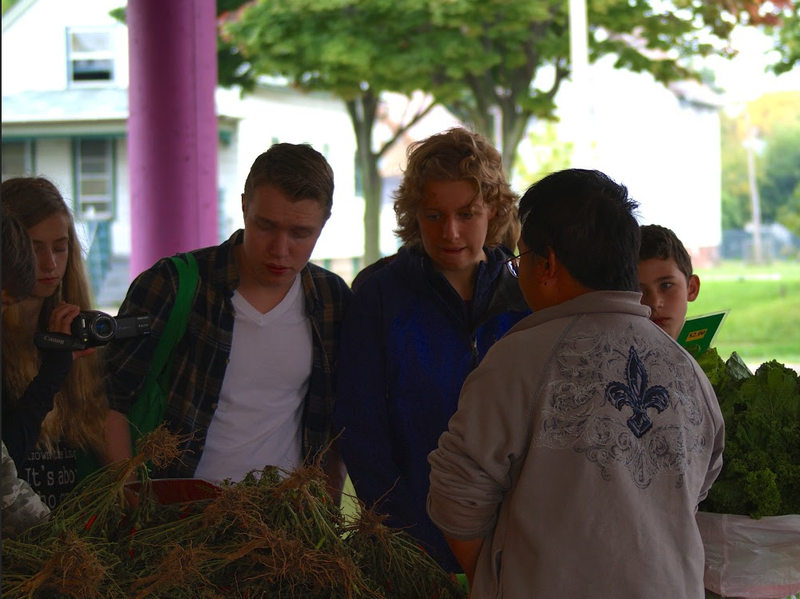 met some of those farmers as well as the Executive Director of Fondy Farms, Young Kim. Mr. Kim took our students on a personal tour of the farm-to-table movement, how it differs from industrial farms, and how social services are linked to the market to provide low-income families, women, and children with better nutrition, education, and community development. Marketing Director Antonio Butts and Director of Development and Communications Jennifer Casey joined Mr. Kim in educating us about the Fondy experience. Students shopped at the stalls (a few tried some extremely hot peppers and the bitter berries ubiquitous in Laotian cuisine! 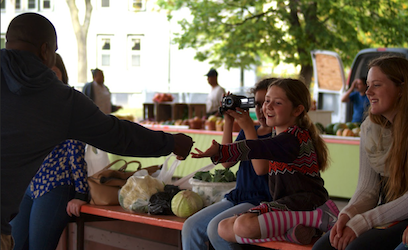 ), interviewed some of the farmers, and returned to school loaded down with vegetables for their own tables, for the making of soup for Racine’s Empty Bowls, and a better understanding of some of the billions of humans whose voices are worth hearing. Mr. Kim also introduced our students to Venice Williams, Executive Director of Alice’s Garden, who gave them a tour of this urban community garden that provides sustainable urban farming, community development, and economic enterprise for its members and the community in which we live. This vision of cultural sustainability, economic sustainability, and environmental sustainability has been part of The Prairie School’s vision for sustainable development since its adoption. As the year progresses, C.L.A.S.S. will be learning more about how the this system affects the lives of individuals as they look to form relationships with and give voice to immigrant, migrant, and local farmers, as well as others who are an integral–and often unappreciated and unheard–part of maintaining our rights to sustenance and health. This entry was posted in All News, All School, C.L.A.S.S., Featured by Communications Department. Bookmark the permalink.